It always seems interesting to me, sometimes even worth reflecting upon, how it happens that for completely different purposes we ‘coincidentally’ or reasons otherwise, keep returning back to places that were somehow special to us in childhood, yet places in adulthood we wouldn’t ever have given much thought to returning. Living in a suburb just outside Philadelphia the likelihood is one that I would be more frequently headed toward the city. And yet, circumstances and interests always seem to take me through the back roads in the complete opposite direction, back to a relatively small town called Phoenixville. A place where I made annual summer visits, and celebrated some family occasions, the home of my Dad’s sister, Emily, her then husband, Lou, and my cousin Emily, who we only now call Emily as an adult, but used to call Emily Jane, kind of like I was Peggy Ann. People spoke to you in full names those days. I might rather have been called portobello mushroom head than that, but the only alternative nickname that ever came my way was Piggy Peggy. I hated Piggy Peggy. And to be reminded on it my youngest sister Michelle even gave me a “Miss Piggy” dangling ornament for the Christmas tree one year, dressed in ballet suited finery with a crown. I admit it, I laughed so hard, I even kept the thing and display it tenderly each year. But back to Phoenixville, and the likelihood of me going there after childhood was about as remote as visiting Timbuktu, not on my travel itinerary. And yet, today I keep returning back to the area, frequently on Saturday visits to the Phoenixville Farmer’s Market, and, coincidentally, where I always get my fresh, pesticide, chemical free mushrooms from Oley Valley Mushrooms, including the meaty, full flavored, earthy, portobello, like for today’s special, Grilled Portobello Mushrooms on Roll, Roasted Peppers, Vidalia Onion, Smoked Cheddar. When my youngest daughter, Alex the Athlete, began playing on her field hockey club team in high school, a club team begun by a former Wales and Britain Olympian with his former Olympian Chinese wife, what do you think the odds, given the whole world, where their first training building, a warehouse beneath an old antique shop was located? Yes, Phoenixville. And so this past weekend, on Mother’s Day, with brunch reservations in the completely opposite direction, and with only about ten minutes to spare upon our arrival, we once again drove through Phoenixville on our way to the new home of the WC Eagles club team, to see Steve Jennings, Alex the Athlete’s now former college field hockey coach at American University, also a former Olympian, who is also now coaching the actual ‘American’ national team for the Olympics, and, who was doing a one day clinic for those younger potential future college recruits. But then seeing Steve Jennings only takes one hug and ten minutes to pretty much transform the spirit into one big positive, winning attitude before saying farewell, and driving back again, towards brunch in the completely opposite direction, through Phoenixville. 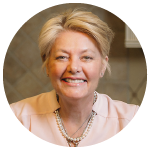 Though I’ve yet to run into her at the market, as it is, the home of my cousin Emily and her family continues now as the same home I annually visited over summers, and celebrated at on some family occasions. Ever in my heart, perhaps soon we might get together for lunch, maybe visit her home, that one special to me in childhood, whose location for completely different reasons ‘coincidentally’ or otherwise, though I never would have thought, keeps me returning back, always, keeping me close. a pinch or two garlic powder over mushrooms when cooking. Preheat oven to 350 degrees. 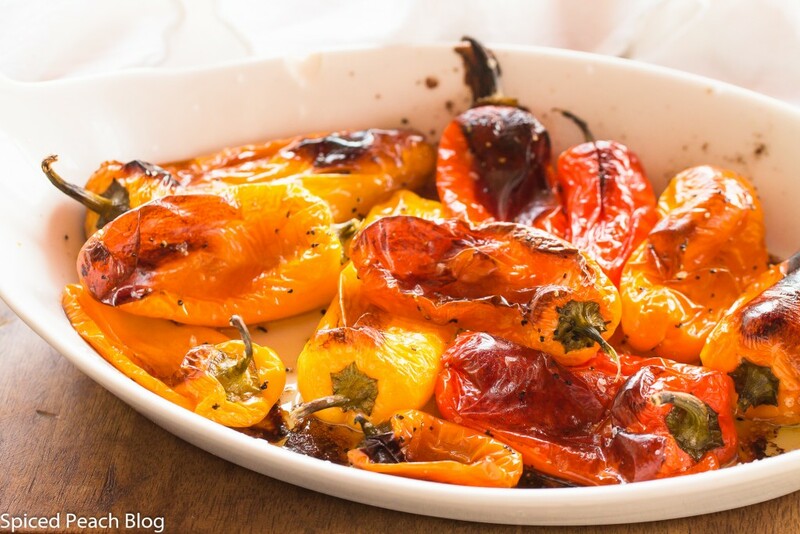 In a small glass dish, lightly toss about a tablespoon olive oil, or a bit more, with the red and yellow peppers, sprinkle over a pinch or two each salt and pepper, stir, and place into oven. Cook peppers around thirty minutes until skins begin to blister and blacken all around, remove peppers from oven, place into a ziploc or paper lunch bag and let steam to loosen the skins about fifteen minutes. Remove peppers from bag, peel off skin, remove seeds, and rinse lightly with water to remove any remaining seeds, chop peppers thinly, stir through a teaspoon olive oil, season with another pinch each salt and pepper, set aside. Reduce oven temperature to 275 degrees. 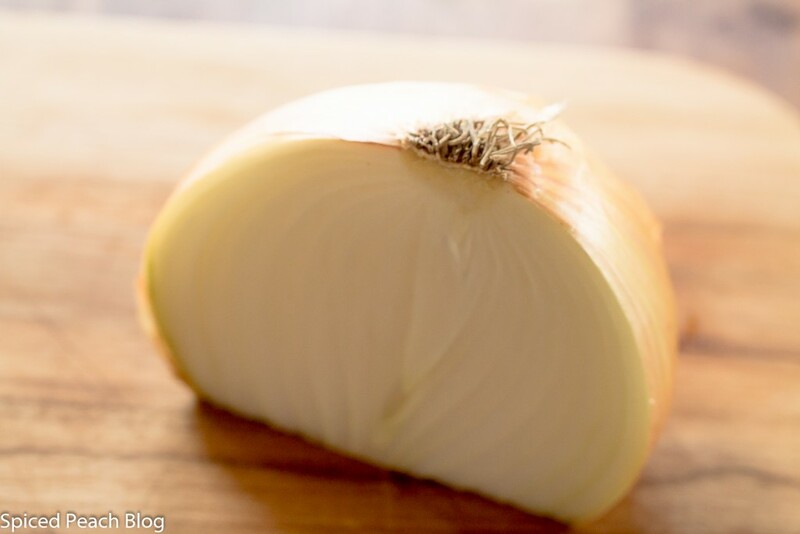 Add a tablespoon olive oil to a small saute pan, tumble in onions and cook on low heat around fifteen minutes until edges begin to brown, sprinkle onions with a pinch of salt and pepper, stir into the seasoned roasted pepper slices. When ready to assemble, put roll halves onto a baking sheet and place in oven to warm and crisp a bit. Heat a large size nonstick pan on medium high heat adding enough olive oil to a little more than film the bottom of the pan, approximately 3 tablespoons, once hot, place in the slices of portobello mushrooms being sure not to overcrowd the pan, mushrooms should not be touching. Sprinkle mushrooms with salt, pepper, and garlic powder and let them cook for about three to four minutes before turning and cooking another two to three minutes, lightly seasoning the other side of the mushrooms upon turning. 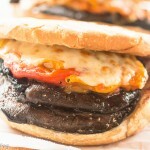 Remove rolls from oven, setting the tops aside, turn heat to broil, place portobello mushrooms onto the bottom half of each bun, topping with the roasted pepper onion mixture, and the shredded smoked cheddar, place under broiler just until cheese is melted, remove from oven, place roll tops onto sandwiches, serve hot immediately. 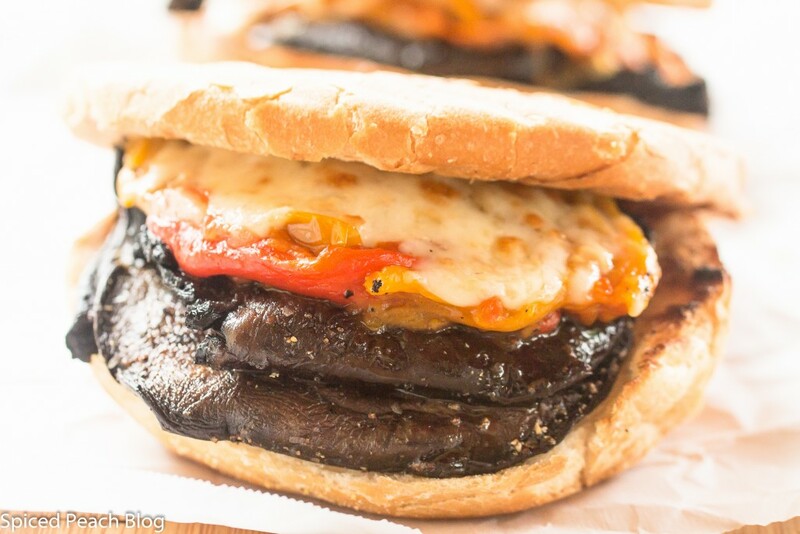 This entry was posted in Sandwiches and tagged Grilled Portobello Mushrooms, Grilled Portobello Mushrooms on Roll Roasted Peppers Vidalia Onion Smoked Cheddar, Oley Valley Mushrooms Phoenixville Farmers Market, Oley Valley Portobello Mushrooms, Phoenixville Farmers Market. Bookmark the permalink. Post a comment or leave a trackback: Trackback URL. It’s funny how we’re drawn to places, as if the universe conspires to bring us back. Perhaps your time there in Phoenixville will not be restricted to field hockey or your farmers’ market visits. Perhaps there is something still left to do there. Interesting to think about. Meanwhile, that sandwich looks fabulous. One of my favorite local restaurants does a panini very similar: grilled poratbello, roasted red pepper, and goat cheese. It is fabulous, as the one you have created is, I’m sure. Hi Kelly, thanks so much, with the goat cheese panini sounds awesome too, I like the tang on that option. I do love this sandwich and cannot get over how much portobello mushrooms, seasoned and cooked well, taste like a juicy steak or meat, so good! It is funny how we are drawn back to places, and your thoughts on purpose are entirely possible, maybe even another effort in getting together with my cousin, who knows. 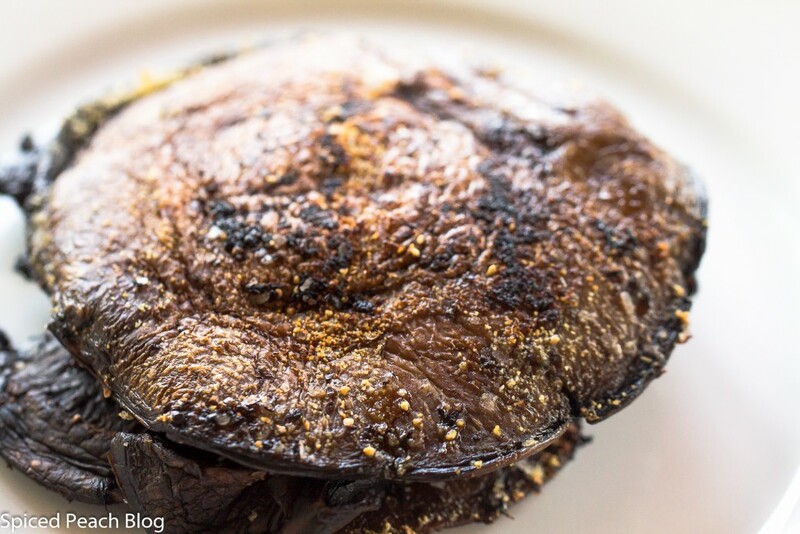 Meanwhile, I’ll enjoy my visits whichever way they go, including fresh mushrooms from the Farmers Market for preparing great sandwiches as this grilled Portobello. Peggy, Loved the family story. I’m not even telling you what I was called but I quickly dropped the Isabelle from Mary Isabelle by the time I was in second grade. I would love that name today but, being a kid…… ding dong ding dong, gets a little old. Anyway, to your stacked portobello sandwich. It looks delicious and I wish I was having it tonight for dinner. I will definitely make this. Hi Mary, thanks so much. Mary Isabelle, actually sounds like a famous queen funding explorers as I remember it in fourth grade. I might have thought you a queen then. 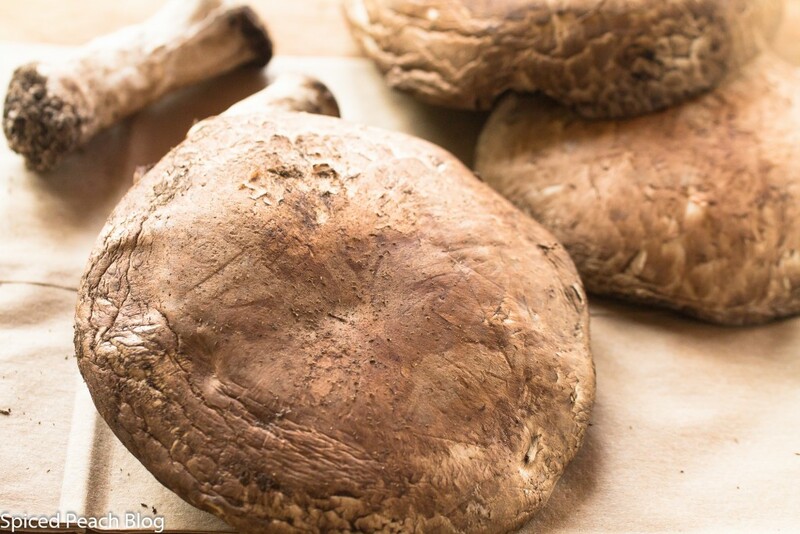 Can’t wait for you to make the sandwich, so flavorful, with proper seasoning and cooking, these mushrooms taste like a good steak, so meaty with a balanced ingredient combination. Enjoy.